Affiliation: Department of Biology, Lund University, Sweden. A wide range of animals, including birds, use directional information from the Earth’s magnetic field for orientation and navigation . The magnetic compass of birds is light dependent and suggested to be mediated by light-induced, biochemical reactions taking place in specialized photoreceptors [2,3]. The photopigment molecules form magnetically sensitive radical-pair intermediates upon light excitation. The ratio of the spin states of the radical pairs (i.e., singlet vs. triplet state) is affected by Earth-strength magnetic fields, which thereby alters the response of the photopigments to light. In birds, such magneto-sensitive photoreceptors have been proposed to be arranged in an ordered array in the eye. Depending on their alignment to the magnetic field, they would show an increased or decreased sensitivity to light [2,3]. The animals would thereby perceive the magnetic field as a magnetic modulation pattern centered on the magnetic field lines, either superimposed on the visual field or mediated by a separate channel . 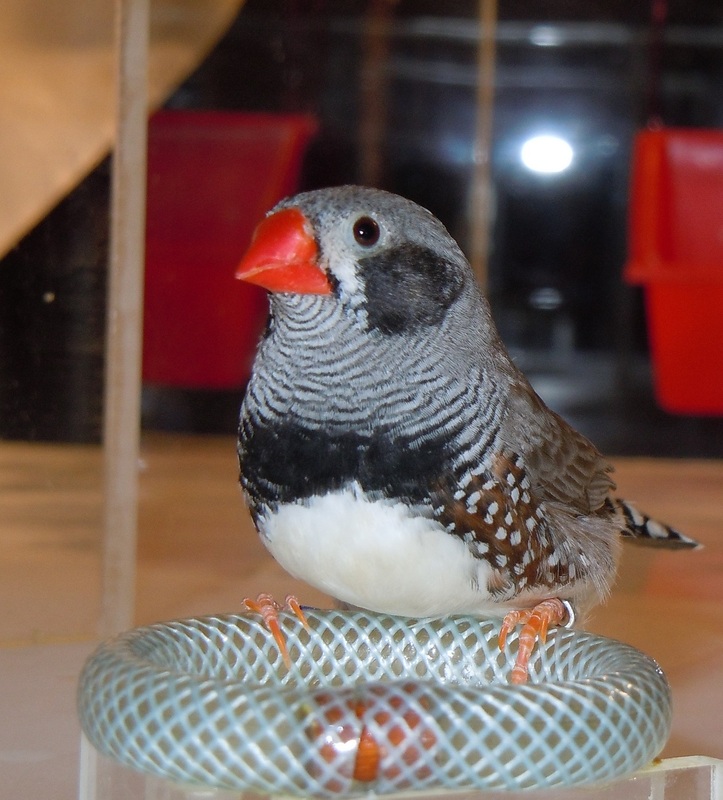 Cryptochromes have been proposed as putative candidate receptor molecules and found to be expressed in the retinas of birds exhibiting magnetic orientation behavior [2,5–7]. Hitherto, the majority of biophysical models on magnetic field effects on radical pairs have assumed that the light activating the magnetoreceptor molecules is non-directional and unpolarized, and that light absorption is isotropic. Yet, natural skylight enters the avian retina unidirectionally, through the cornea and the lens, and is often partially polarized. Also, the putative magnetoreceptor molecules, the cryptochromes, absorb light anisotropically, i.e., they preferentially absorb light of a specific direction and polarization. This implies that the light-dependent magnetic compass is intrinsically polarization sensitive [8,9]. We developed a behavioural training assay to test putative interactions between the avian magnetic compass and polarized light. Thereby, we trained zebra finches to magnetic and/or overhead polarized light cues in a 4-arm “plus” maze to find a food reward with the help of their magnetic compass . We found that overhead polarized light affected the birds’ ability to use their magnetic compass. The birds were only able to reliably find the food reward when the polarized light was aligned parallel to the magnetic field, but not when it was aligned perpendicular to the magnetic field . We found this effect when using both 100% and 50% polarized light. Our findings demonstrate that the magnetic compass of birds, and likely other animals, is polarization sensitive, which is a fundamentally new property of the light-dependent magnetic compass. Thus, the primary magnetoreceptor is photo- and polarization selective, as recently suggested by biophysical models . The magnetic compass thus seems to be based on light-induced rotational order, thereby relaxing the requirement for an intrinsic rotational order of the receptor molecules (as long as rotational motion is restricted). The putative cryptochrome magnetoreceptors may therefore be distributed in any, also non-randomly oriented, cells in the avian retina . Similar effects are expected to occur also in other organisms orienting with a light-dependent magnetic compass based on radical-pair reactions. Our findings thereby add a new dimension to the understanding of how not only birds, but animals in general, perceive the Earth’s magnetic field. It remains to be shown to what degree birds in nature are affected by different alignments of polarized light and the Earth’s magnetic field. It could be a mechanism to enhance the magnetic field around sunrise and sunset, when polarized light is aligned roughly parallel to the magnetic field and when many migratory songbirds are believed to determine their departure direction and calibrate the different compasses with each other for the upcoming night’s flight. During midday, when polarized light and the magnetic field are aligned roughly perpendicular to each other, the magnetic field would be less prominent, thus would be less likely to interfere with visual tasks like foraging and predator detection . Roswitha Wiltschko, Wolfgang Wiltschko, "Magnetic Orientation in Animals" (Springer, 1995). Thorsten Ritz, Salih Adem, Klaus Schulten, "A model for photoreceptor-based magnetoreception in birds", Biophysics Journal, 78, 707–718 (2000). Article. Christopher T. Rodgers, P. J. Hore, "Chemical magnetoreception in birds: The radical pair mechanism", Proceedings of the National Academy of Sciences, 106, 353–360 (2009). Abstract. Ilia A. Solov'yov, Henrik Mouritsen, Klaus Schulten, "Acuity of a cryptochrome and vision-based magnetoreception system in birds", Biophysics Journal, 99, 40–49 (2010). Article. Miriam Liedvoge, Henrik Mouritsen, "Cryptochromes—a potential magnetoreceptor: what do we know and what do we want to know?" Journal of Royal Society Interface, 7, S147 –S162 (2010). Abstract. Christine Nießner, Susanne Denzau, Julia Christina Gross, Leo Peichl, Hans-Joachim Bischof, Gerta Fleissner, Wolfgang Wiltschko, Roswitha Wiltschko, "Avian ultraviolet/violet cones identified as probable magnetoreceptors", PLOS ONE, 6, 0020091 (2011). Abstract. Kiminori Maeda, Alexander J. Robinson, Kevin B. Henbest, Hannah J. Hogben, Till Biskup, Margaret Ahmad, Erik Schleicher, Stefan Weber, Christiane R. Timmel, P.J. Hore, "Magnetically sensitive light-induced reactions in cryptochrome are consistent with its proposed role as a magnetoreceptor", Proceedings of the National Academy of Sciences, 109, 4774–4779 (2012). Abstract. Rachel Muheim, "Behavioural and physiological mechanisms of polarized light sensitivity in birds", Philosophical Transactions of the Royal Society B : Biological Sciences, 366, 763 –771 (2011). Abstract. Jason C.S. Lau, Christopher T. Rodgers, P.J. Hore, "Compass magnetoreception in birds arising from photo-induced radical pairs in rotationally disordered cryptochromes", Journal of Royal Society Interface, 9, 3329–3337 (2012). Abstract. Rachel Muheima, Sissel Sjöberga, Atticus Pinzon-Rodrigueza, "Polarized light modulates light-dependent magnetic compass orientation in birds", Proceedings of the National Academy of Sciences, 113, 1654-1659 (2016). Abstract.